Do you search for four-leaf clovers? Avoid black cats? Never walk under a ladder? Make a wish when you drive over a bridge? Cross your fingers? Well, we have another way for you to “get lucky” and it’s super easy. Just go to the Allen Tate Company Facebook page and “like” us. 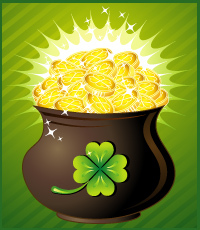 Between now and March 17, we want to boost our “likes” (and your luck!) by awarding three $50 Visa Gift Cards to three lucky people who “like” the Allen Tate Company on Facebook. On March 18, we’ll draw three winners from all of our Facebook friends. Winners will be notified directly and posted on Facebook. Contest is open to anyone age 18 or older. No purchase required. And while you’re visiting our Facebook page, please take a moment to talk to the Allen Tate Company. We’re feeling pretty lucky to know you. We would love to hear what you have to say and how we can help you! The ACC Tournament is back in Greensboro!